Call Robert at (914)299-3690 or email now! Interactive! Guitar, puppets, rhythm instruments, role-playing! 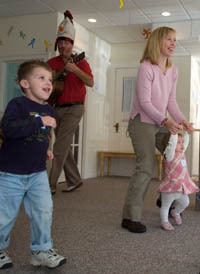 Robert's Music and Movement Party combines creative play and movement: often marching, jumping or dancing. One song mixes a bedtime lullaby with a rock and roll jumping song. In another, the ants go marching into a spider and then must duck and hide. Robert alternates sitting and standing, high energy and tranquility, music and comedy, singing and moving, well-tested original material and old favorites. His material masquerades as pure entertainment but is also aimed at teaching basic music competency, rhythmically and tonally. One of the singing/movement pieces for slightly older children challenges them to be able to sing "Yes" in one special place in the song, and "No" in another. Movement is introduced, as the children jump forward with "Yes" and backward with "No." The results are playful as the children advance, forcing Robert back, and then retreat, allowing Robert to recover. Robert's musical game accomodates both a four-year-old and a toddler. Drawing from a vast repertoire, Robert's experience allows him effortlessly to entertain disparate ages.